NASA's Lunar Atmosphere and Dust Environment Explorer (LADEE) observatory launches aboard the Minotaur V rocket from the Mid-Atlantic Regional Spaceport (MARS) at NASA's Wallops Flight Facility, Friday, Sept. 6, 2013, in Virginia. WALLOPS ISLAND, Va. — After a near-perfect launch late Friday (Sept. 6), NASA's newest moon probe has encountered its first glitch on the road to Earth's nearest neighbor. NASA's robotic Lunar Atmosphere and Dust Environment Explorer (LADEE) blasted off atop a Minotaur V rocket from here at the space agency's Wallops Flight Facility in a dazzling Friday night launch that was visible from wide stretches of the U.S. East Coast. But there's no reason to panic, NASA officials said. "This is not an unusual event in spacecraft," Pete Worden, director of NASA's Ames Research Center in Moffett Field, Calif., which is leading the LADEE mission, said during a press conference in the wee hours of Saturday morning (Sept. 7). LADEE was developed and built at the Ames center. "I've been involved with a lot of missions, particularly missions with small spacecraft," Worden said. "[They] quite often have things that don't come on the way you want. The really important thing is that we have full communications. Everything is healthy onboard the spacecraft. Everything is working, and the computer did what it was supposed to do." Engineers will work to develop a repair plan over the next few days. But there's not a great deal of time pressure at the moment, Worden said. LADEE will take nearly a month to get to the moon on its long and looping route. The Lunar Atmosphere and Dust Environment Explorer will uncover details of the moon's thin atmosphere. See the full LADEE moon dust infographic here. Further, the probe has a backup if there is something seriously wrong with the reaction wheels. "The nice thing about this is that we have two ways to orient [LADEE]," Worden added. "One is with thrusters, the other is with reaction wheels. So we're pretty confident that we're going to get it in the right state." The Minotaur V rocket took off on time at 11:27 p.m. EDT (0327 Sept. 7 GMT), lighting up the night spectacularly as a crowd of onlookers watched in amazement. 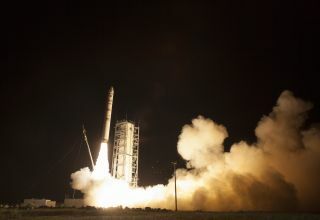 From the ground at Wallops, observers could see the stages of the rocket separate and ignite in the perfectly clear night sky. Skywatchers reported seeing the rocket streak through the sky from Massachusetts, New York City, Washington, D.C., North Carolina and many other East Coast locales. All but one of NASA's moon launches have taken off from pads in Cape Canaveral, Fla. The space agency's Clementine spacecraft launched from California's Vandenberg Air Force Base in 1994. After its smooth launch, the $280 million LADEE spacecraft is now beginning its 30-day journey to the moon. The loveseat-sized lunar probe is carrying instrumentation that scientists hope will help them solve some big moon mysteries. The probe is built to measure the extremely thin lunar atmosphere (called a surface boundary exosphere) from its prescribed low orbit. LADEE's exploration of the atmosphere could help scientists better characterize the wispy atmospheres of other bodies in the solar system. Surface boundary exospheres are actually the most common type of atmosphere in the solar system, mission team members have said. LADEE could also help researchers solve a mystery dating back to before the Apollo era. A robotic NASA lander first caught sight of a strange glow on the moon's horizon before sunrise. Apollo astronauts also observed the luminosity, and LADEE is expected to help NASA scientists uncover the reason for it. The spacecraft will examine dust particles lofted high into the lunar atmosphere, the leading explanation for the glow. LADEE is also carrying a new laser communications technology demonstration that could help lay for the foundation for a high-speed "interplanetary Internet." The spacecraft will beam information back to ground controllers here on Earth using lasers, as opposed to the usual radio waves, during a 30-day checkout period when LADEE arrives at the moon.